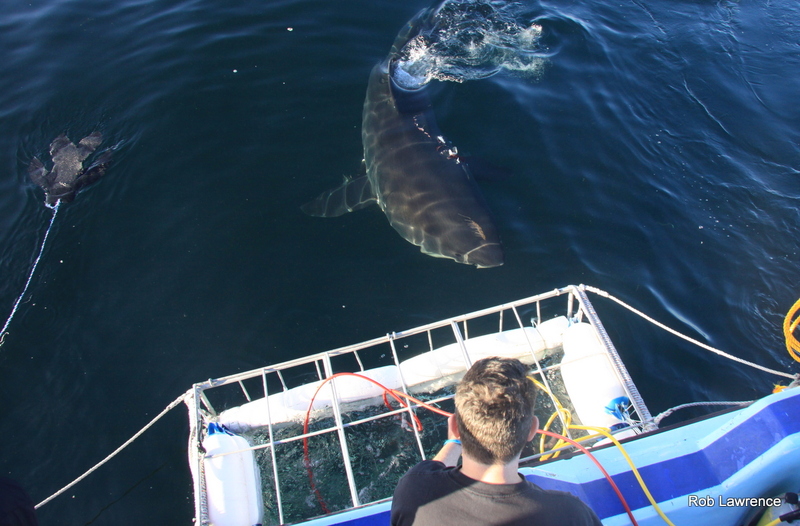 One of the things we love, almost as much as sharks, is hearing from our guests and how they enjoyed their time spent with us and our False Bay sharks. We love to read their stories, reviews and tweets. We also spend time with our communities, and take in a number of job shadow applicants. We take these young people for an experience on the boat, we get them in the cage as well as take time with them, teaching the in’s and out’s of eco-tourism in the shark diving sector. Below, we have added three such short stories to this post, so you too may enjoy them as we have. Firstly, please meet Aaishah Miller. Here is her story. I am 16 years old and currently job shadowing at ASEC. On the 29th June I went on my first shark trip. The boat trip to seal island alone was really amazing, just watching all the buildings disappear as the boat continued to move forward. Along the way to seal island I saw dolphins swimming along with the boat, which was really amazing since I had never seen a dolphin before ,besides on tv and in books. We finally arrived at seal island and unfortunately we didn’t witness any shark breaches, but that was made up for later when not one but five sharks swam by the boat. The first time I saw one of the sharks, I was really amazed, because here in front of me was this beautiful creature and I could not understand why so many people were so terrified of them. The first four people got in the cage and I couldn’t wait for my opportunity to finally get into the cage. When I finally got my chance to get into the cage, I was really excited. I had on my wet suit, camera in hand all ready for the experience of a lifetime as most people explained it to be. Unfortunately as soon as the cage was closed I panicked and got claustrophobic. My first thought was to get out, to tell them to open up and just get out. But then I told myself, that if I got out now I’d always regret it, I mean here I was in the cage waiting to see some sharks. This was something I had wanted to do for as long as I could remember, and now that i finally got the opportunity was I really going to get out before even going under water and seeing some of these beautiful sharks? So I got my breathing under control and I went under water and that’s when I saw it. 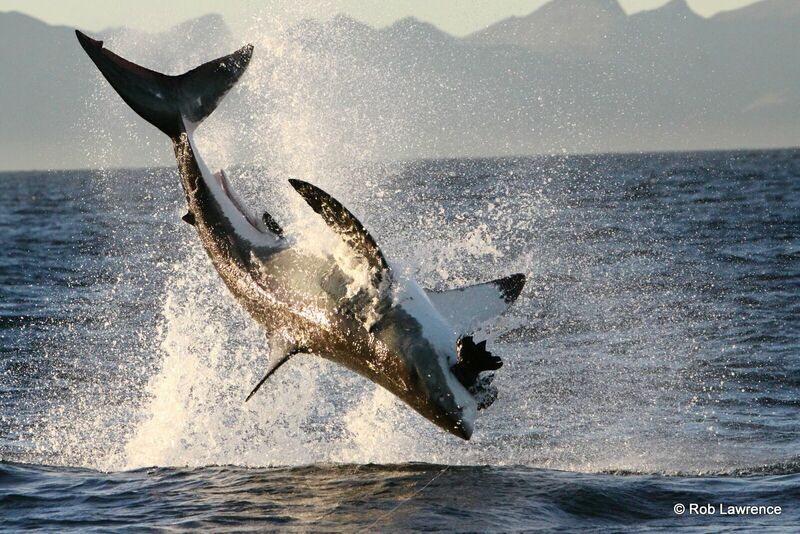 If I thought seeing a shark from the boat was amazing, then this was probably 100 times better. The shark was huge, it looked so beautiful just swimming past the cage. And suddenly I forgot all about being in the cage and just concentrated on this beautiful creature in front of me. I cannot describe how amazing that was, you’d have to experience it for yourself to know exactly how I felt at that moment. That experience I can honestly say was the best experience of my life so far. And If I could get the opportunity to do it again I’d do it in a heartbeat. Aaishah came to us, shy and introverted, but with a quiet passion for tourism and the ocean. Once going on the boat, Aaishah had a re-think about her choice of careers, and last I heard, Aaishah was looking into Marine Biology! Paul was one of our guests who, in his own words, eloquently describes his “Up Close and Almost Too Personal” experience with his Great White Shark Dive. Let’s take a quick gander at his experience. How do you write about a great white shark, it’s immense never ending silvery flanks catching the light as it scythes through the bubbly gloom six inches in front of your face? With difficulty. Just to see one of these behemoths is a privilege and an emotional one at that for anybody who knows anything about these misunderstood monsters of the deep. The Blue Pointer 2, a 36-foot vessel that sports two 300hp engines on the aft, sits comfortably at its berth in Simonstown on Africa’s Cape Peninsula. It’s a custom vessel built for shark cage diving. With an upper deck for the non-divers, an on-board toilet and a cabin there’s plenty of room to move around in. It is captained by Rob Lawrence, one of the pioneers of the shark cage diving industry. He’s worked with these sharks since 1992 when it all began. The air is cold but brimming with opportunity and the call of seagulls. We stand around chatting about the day ahead, some of us eyeing the galvanised steel cage in the back of the boat a little more than others. We’re then formally welcomed by Leigh de Necker, the team’s marine biologist. The briefing was sound and informative. An array of snacks and beverages are offered to the guests before heading out of the harbour, escorted by a long synchronised line of cape cormorants riding the contours of the waves. The combination of blue ocean swell and the amphitheatre of mountains which covers most of the horizon culminates into some seriously beautiful scenery. With many of us doing this for the first time the salty air was thick with nervous expectation and excitement. We’d all seen the photographs at the booking office; magnificent aerial attacks on seals and close-up shots of their massive jaws lined with neat conical teeth. The fact that they can reach 6m in length (and almost 2 tonnes in weight if not more) leaves a lot to the imagination. Would we be that lucky? Would we even see one? No more than thirty minutes later we’re anchored on the windward side of seal island; close enough to ‘feel’ the rhythmic crashing of blue waves onto this patch of rock that is home to a population of nearly 40 -60 000 Cape Fur seals and a myriad of birdlife. The weather was perfect and the swell was tame but the visibility was only about 3m due to some unfavourable wind the night before. As the crew go about their preparations the rest of us wait. Five minutes or fifty nobody knows for how long. The crew begin working the chum bucket and the ‘thumper’ sends its distinct message into the murky depths. They have knocked on natures door but she still has to come to the party. The suspense is almost tangible. Suddenly a shout from above jolts everybody out of their reverie. The divers suit up and with a reminder that to keep your limbs to yourself, a sagacious proposition for sure, we carefully slip into the cage. Before submerging beneath the surface I’m handed a regulator that’s attached to a hookah system. Not having to come up for breath is a real advantage as it enables you to totally immerse yourself in the cold (in my opinion anyway), bubbly and adrenaline filled surroundings. With no warning at all you’re staring into the flanks of the aforementioned shark. She came out of nowhere, a trick she knows well. She appears, disappears and then reappears from a different angle. Once or twice she swims straight for you before breaking off at the last second. My head was constantly on a swivel trying to maximise my ‘facetime’ with these creatures of the deep. Before I knew it I was on the deck trying to warm up in the sun and giggling like a child. In one morning with African Shark Eco Charters, four great white sharks danced to the song of the chum; a 3m female with a bent dorsal fin, 2 sub adults just shy of that length and “Patches”; a 4.5m female aptly named due to a prominent white marking on her left scute. We were fortunate. This is nature after all and she makes no guarantees. To top off the morning itinerary a complementary coffee and discount at the harbour view restaurant, “Saveur” is offered. I definitely took the opportunity to sit back and reflect on how privileged I had been to be able to look behind nature’s curtain into a world we know very little about. Almost nothing is known about their reproduction nor their movements and the bit we do know about their ecology and behaviour makes for some very interesting reading. For decades, they’ve been the subject to an unwarranted “man-eater” image but does a species that’s characterised by such raw power and grace deserve such a reputation? I think not. Thank you Paul, it was such a pleasure having you with us, and receiving your amazing story. Next we have Lailah, she was a tourism student, finishing her final year, and required an internship, which we were thrilled to offer. Hear what Lailah had to say of her time with us in the ASEC office, handling the behind-the-scenes and day to day activities. I am a 19 year old Tourism student who needed to complete an internship at an established tourism business in order to complete my studies. Since I have a deep passion for our natural marine beauty and the animal abundance we are blessed with here in False bay, and have lived here for many years, I had decided to go to a local tourist hot-spot, Simons town. In searching online I came across African Shark Eco Charters and after reading their excellent reviews, mission and vision they were the first company I had approached to complete my internship. I sent out many emails trying to convince busy establishments to accommodate me. The next day I received a swift response from their booking and client liaison officer / manager Nadine Bentley. She stated they were extremely busy with an important deadline, but would be happy to accommodate me in a couple of weeks. We later arranged dates for me to come into the office. Nadine was hospitable and very accommodating, thinking little of taking the time to explain how things work to me regarding all office operations. I learned so much facts about things like weather, the sea conditions and the marine life that call the ocean home. She was patient in taking time away to give me tasks and check them promptly, kindly helping me if any mistakes were made. I watched her deal with an emergency situation calmly and efficiently, making sure everything ran on schedule without fault, showcasing ASEC’s drive to make sure every guest’s experience is as smooth as possible and to help with any situation. They even help clients find other shark tours if they are fully booked themselves. They are wanting to make sure people get to learn about sharks even if they don’t book with ASEC. 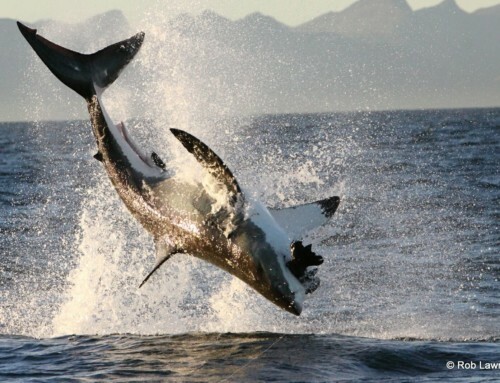 She further expressed African Shark Eco Charter’s passion for the Apex predator the great white shark. They strongly believe in changing the perception people have of great white sharks and respecting the balance they bring into the ecosystems in which they live. They are completely ethical in their practices with dealing with the sharks and their clients, ensuring the highest possible standards in the shark industry. By always being honest and transparent with guests. I have witnessed canceled trips in my time here, due to bad weather. ASEC does not compromise the safety of their guests by going out in dangerous conditions in any way by doing so. But with Rob Lawrence, the owner, still going out with most trips, he ensures the trips are as informative as possible while still being personal. 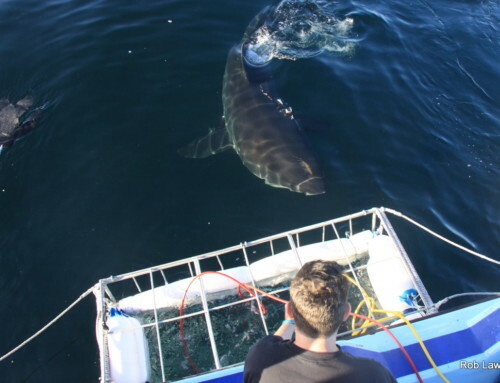 With over 20 years’ experience in the field, he is one of the most knowledgeable people involved in all areas of the white shark cage diving industry in South Africa. Thanks for sharing these experiences through the eyes of these three great people. If you have been out with us, or come for an educational experience and want to tell us about it, please drop us a line, we would love to hear from you, almost as much as we love sharks. I would like to end by saying as a Tourism student, I strive to work at a company like ASEC one day, that focuses on showcasing the natural curiosities False Bay sharks have to offer, without infringing on their natural environment, or changing their habits by feeding. A company that endeavors to accommodate every client and help out those who they cannot. With ethical practices that ensure the sustainability of the industry. ASEC has expressed interest in having future Tourism students from my college complete their internships at their company. Which also shows their interest in growing and supporting the growth of the industry and its future by helping the students fulfill their internship obligations while practically experiencing what working in a tourism business entails.